Women can do some pretty creative things to support a stay-at-home lifestyle sometimes. 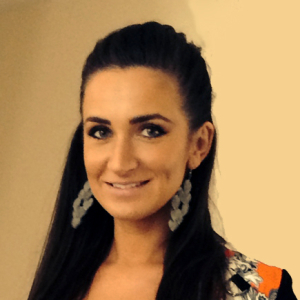 In the case of Paula Pokora, of Cheltenham (a spa town in the U.K.), that involved launching a makeup brush line, Nanshy. The name is a take off of some cute babblings from the mouth of her son, Dominic, who was a toddler at the time she launched her line in 2012. Paula told me that she had been involved in some other online beauty ventures before launching Nanshy, and despite all of the makeup brushes already on the market, she still thought there was a space to launch an affordable, cruelty-free brand with creative colors and special packaging details. 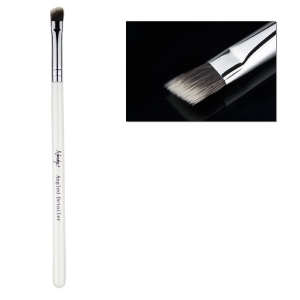 Nanshy’s brush line — which is, like many brushes, manufactured on contract in China — features handles that are plastic and white (with subtle chocolate undertones). While some of the handles are just straight makeup brush handles, some others also have a curvy ergonomic appearance (in the style of Sonia Kashuk’s curvy line in the US). The ferrules are either a standard shiny aluminum (in her eye kit) or painted white (in the luxury 13-brush set). 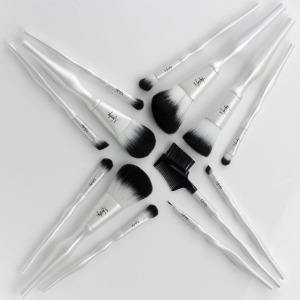 Like most makeup brushes on the market, the brush hairs are hand tied together and then crimped and glued in the ferrule with non-water soluble epoxy. The handles are also secured to the ferrule with glue and crimping. We reviewed two packs of brushes from Nanshy, which are available through Amazon.com. 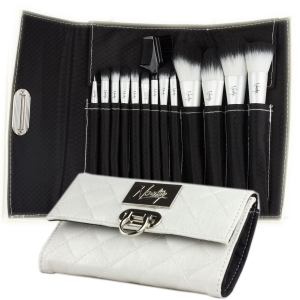 The Nanshy Luxury Makeup Brush Set, which features 13 brushes in a creative case that packs down slim, and retails for $39.95. The Nanshy Eye Brush Set, which includes 7 brushes, for $34.95. Overall, these brushes are a very good value. What does that mean? It means that they are not top-of-the-line brushes, nor are they meant to be. These bring a solid, mid-level brush to the masses at an affordable price. If I were going to launch an affordable brush line, I would invest most of my attention in producing a high-quality hair assembly and take cost out of the rest of the brush. That is precisely what it appears hat Paula has done with her brushes. Paula seems to have invested most of her attention in getting the hair of the brushes just right. 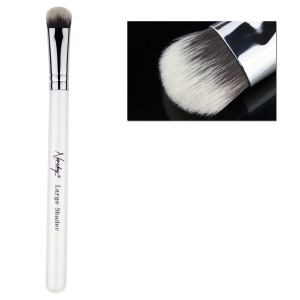 The brush fibers are soft, do a decent job at holding and applying product. But the best part of Paula’s brushes are the shapes the hairs are packed into, with the proper density. Density in brush hair assembly is important. The hair in some lower-end brushes is so lightly packed that you can tell they are cheap the moment the hair touches your face, and the hair splays all over the place. That is not the case with these brushes. The brush hair feels substantial. The 13-brush Nanshy is a perfect travel set, given the creative case that folds down nice and slim. And the big face brushes in the big kit are very lovely. While the angled detailer and large shader in the eye kit have already become favorites, the big face brushes in the luxury set are fantastic. Among them: a flat-top foundation brush, a traditional wet foundation brush, a fluffy powder brush, a blush brush, with a slight angle. Why do we like these face brushes so much? Because the brush hair is packed so nicely, with quality synthetic fibers, the brushes give a nice finish. The brush heads are also substantial. Unlike some luxury Japanese face brushes that are so small and precise, these brushes are a healthy size that allows you to cover your face quickly and with good results. Also, the relatively low price paid for these brushes really does make them more enjoyable. For one, it would be expensive to buy higher quality of brushes of this style. Consider, for example, that you can get the entire eye set for about the price of one or two MAC eye brushes. … That price also means you don’t have to stress about losing or damaging one. Finally, synthetic fiber is easier to keep clean and bacteria-free than real animal hair brushes, which is a nice feature when you’re applying foundation directly to skin (even if you’ve applied primer!) These brushes wash and dry quickly. If we have any issues with our Nanshy brushes, this is it: The eye set smelled strongly of glue when it arrived, although it did dissipate after a good washing or two. But, honestly, you should always wash brushes once or twice before you use them, as they were either sitting in a box during yucky shipping or on a store shelf … .